Thank you for joining Scripture & A Snapshot. 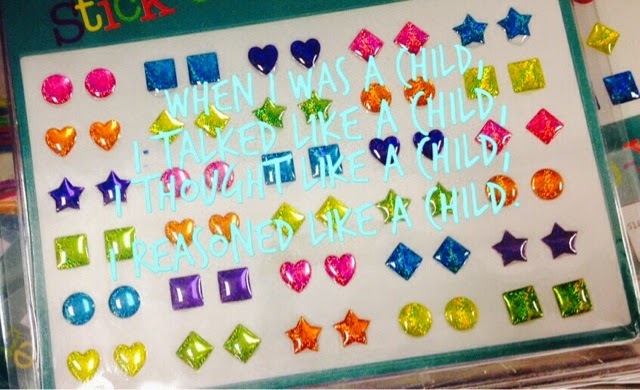 My daughter spotted these stickers when we were shopping this week and we discussed how much she used to like them along with the fact that both of us had forgotten about them until we saw them again. Some parts of her childhood are already behind her. Leave a comment with a verse that God has placed on your heart this week, or leave a link to your own post sharing a Scripture and a snapshot. Take time to visit some of the other links, too. If you would like to join our group Pinterest board for Scripture & A Snapshot, simply follow the board then let me know your Pinterest name or email used there so that I can add you to it. 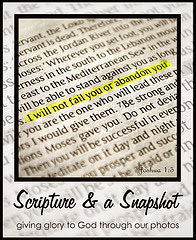 Jennifer~a very creative shot that pictures the Scripture quite well. Blessings on this Sunday. Very sweet picture! With my daughter's birthday coming up, I am seeing how she is starting to put some of her childish ways behind her. It's bittersweet in some respects, but I also see how she is maturing in the Lord as well as in her mind and body, and that is exciting!